For centuries, the Yixing (say: E-Shing) teapot has enjoyed the reputation among Chinese tea drinkers as being, in the words of one writer, “a superior vessel for tea drinking.” In fact, scientific studies have been conducted in an effort to pinpoint those objective characteristics that have won Yixing ware such praise. But what of the history behind these teapots?The Yixing teapot was the first pot designed specifically for brewing tea. Prior to about 1500 CE, the Chinese preferred a powdered tea mixture whisked in a teabowl. These first Yixing teapots (also spelled Ixing, I-hsing or Yi-Hsing) originated in the Jiangsu (or Kiangsi) province about 100 miles west of Shanghai. Initially, the Chinese Imperial Court preferred the more ornate, glazed tea vessels. Yixing became instead the favorite of the “literati” or class of Chinese intellectuals for their simplicity and naturalism in both material and form. European artisans also imitated the earthenware Yixing pots, inspiring such well-known British ceramic enterprises known today as Wedgwood. History tells us, however, that the British were not terribly successful in their attempts to copy Yixing, and continued to import much of their ceramic tea ware from China. Yixing teapots, renowned for their quaint charm and unique tea brewing qualities, have enjoyed a remarkable resurgence of artistry and popularity in the last few years. Yixing, near Shanghai, has a long history as the “Pottery Capital” of China. 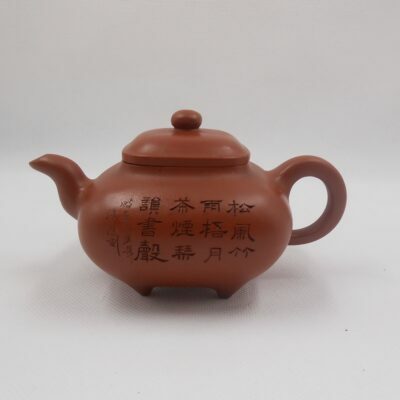 It was here during the Ming Dynasty (1368-1644 CE) that the world’s first teapots were created. 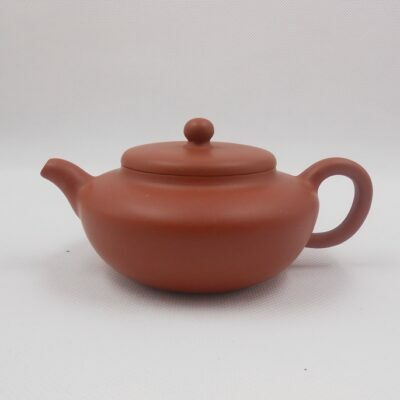 During the years that followed, the distinctive reddish stoneware teapots of Yixing came to be considered the “best vessel for brewing tea” by Chinese tea aficionados. In the late 17th century Yixing teapots were introduced to Europe along with the first tea shipments, and provided the models for the earliest Dutch, German and English teapots. The long-standing celebrity of Yixing teapots is due to several reasons. First, when tea is brewed in teapots made from the special “Zisha” (purple sand) clay, a tiny amount of tea is absorbed in the interior. These teapots are never washed with soap–just rinsed with cold water. With continued use, a layer of tea sediment forms and one is actually brewing tea within tea. This is ideal for enhancing the flavor, color, and aroma of fine Green or Semi-black tea. 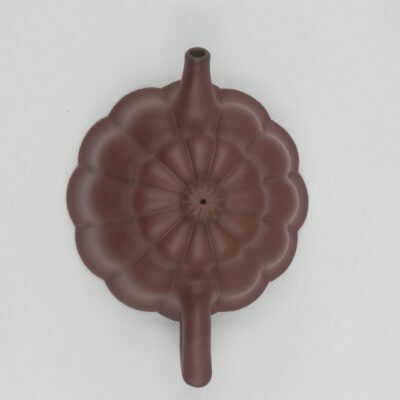 The “Zisha” clay and the snugly fitted lid conserve heat within the teapot, further improving the brewing process. 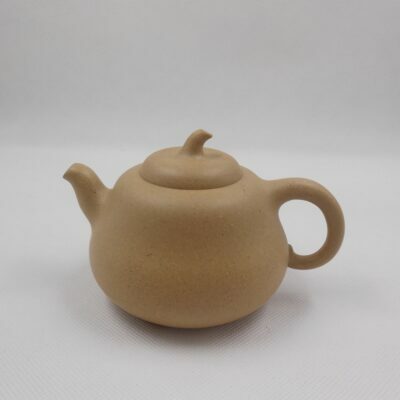 Many Yixing teapots designed for the Chinese market are smallish (100-300 ml) by Western standards. This is so the entire contents of the pot may be quickly emptied after each infusion. This method assures that tea is served fresh, hot and strong without the cooling and bitterness that may occur when tea leaves are left to steep too long in a larger pot. In addition to their brewing function, these pots are simply lovely, with a rustic elegance of form taken from nature, simple geometry, or pure whimsy, and a tactile quality that almost urges that they be picked up and handled. Potters of Yixing have traditionally signed their works with their personal “chop marks”. This practice reflects the potter’s great pride of workmanship and provides collectors with the satisfaction of attributing work according to potter and time period. Yixing enjoyed long periods of prosperity during the Ching Dynasty (1644-1911 CE).During the early Republic (1911-1938) Yixing wares were exported in quantity to Japan, Southeast Asia, Europe and the United States of America. The great turmoil of war and revolution in China during the 1930s and 1940s brought the manufacturing of Yixing teapots to a halt. It wasn’t until 1954 that the Chinese government established communes for the purpose of gathering together the old master potters to recruit and train a new generation of potters, thus insuring that the great traditions would be preserved. This process continued despite the difficulties of the Cultural Revolution in the 1960s. By 1979 the Yixing Purple Sand Factory #1 employed 600 workers. Still, only a handful of potters were master artisans. Most produced utilitarian wares for the domestic market. In the mid-1980s, the reopening of China brought a “rediscovery” of Yixing teapots by Chinese art collectors and tea connoisseurs outside of China. With this infusion of enthusiastic patronage the artistic potential of the new generation of Yixing potters burst into bloom. Hong Kong became the focus for international exhibitions with collectors drawn from Chinese communities in Asia, particularly Singapore and Taiwan. In 1988, an exhibition entitled “Innovations in Contemporary Yixing Pottery” was presented by the Flagstaff House Museum of Tea Ware in Hong Kong. Over 200 of the finest works by leading potters were presented. This splendid display of form, theme and workmanship as created by the new generation was absolutely dazzling. Some works equaled and even surpassed the efforts of the great master potters of the Ching Dynasty! This outpouring of innovation and artistry has continued with an enthusiastic following of knowledgeable collectors eagerly awaiting each year’s abundant harvest of new designs and re-creations of the old ones. 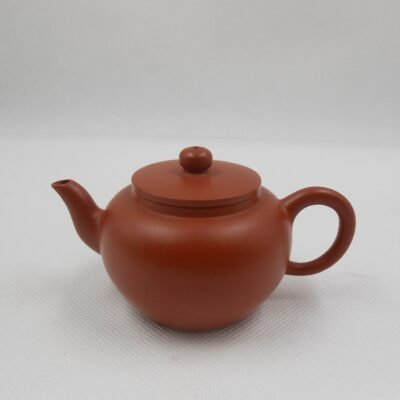 Interest in Yixing teapots is growing in the United States as well. Over 100,000 people took the opportunity to view the superb Dr. K.S. Lo Collection of Yixing Teaware during its 1990-92 North American Tour. The exhibition was held at the Phoenix Art Museum, the Chinese Cultural Center of San Francisco, the Indianapolis Art Museum, and the Royal Ontario Museum in Toronto.